The “Micky Kemp Story” really began for me last November when I saw him perform an acoustic opening set for Southside Johnny and the Asbury Jukes at their Copenhagen gig. Up to then, I had certainly heard of Micky’s name but that was pretty much as far as my knowledge of his song writing and performing skills went. The set I saw was relatively short, but nevertheless I came away impressed and intrigued enough to want to know more about Micky’s musical career. As things turned out, I’d heard that Micky was heading off to New Jersey at the beginning of 2005 with a view to recording a new CD and, as if that wasn’t enough, it was going to be produced by none other than Bobby Bandiera, one of my all-time favourite New Jersey musicians whose career I have been following for many years. Needless to say, my attention was well and truly attracted! As things turned out a little further, I just happened to be in the UK at the same time as Micky was doing some special shows to promote the release of Blind Faith and… the planets must have really aligned because the shows also featured special guests Joe D’Urso and Stone Caravan who were literally passing though the UK en route to Italy for their annual tour. By the time I caught up with Micky, I had a whole bunch of things I wanted to know and as you can see from what follows, Micky was gracious enough to answer every single thing I asked him. I began by asking Micky if he could take me back to the time when he first got the “bug” to perform. Micky: Seeing Joe Ely, a great Texan, singer songwriter perform in London really made me think about doing it myself. Micky: Since I first picked up the guitar; the only reason I learnt the few chords on the guitar I know was so I could write songs. Micky: Many, many… but probably Bruce Springsteen as the strongest, along with perhaps Steve Earle and Tom Russell, one of the great unsung writers. When did Blind Faith start to formulate in your mind? I was watching the news showing the terrible atrocities taking place around the world, Micky: Iraq particularly, and thinking of the way some of the people follow blindly the word of their leaders, on both sides, and how like a damaging relationship, or bad situation, leaves people with the same misplaced hope that one day it will be right, when it’s so obviously wrong in the here-and-now. OK, so there has to be a story behind the backing band on the album… I mean, this could be Micky Kemp & the Asbury Jukes… so how did this come about? When and where did you first come across these guys? Micky: I saw Southside perform maybe back in the mid 80’s… I absolutely loved him and the band. Never once thought I’d get to record and play with them… they really are a great bunch of people. As far as producers go, you got yourself a helluva guy here with Bobby Bandiera… tell me about the production and arrangement… did you have an idea in your own mind as to how this album would sound or did Bobby take your songs and run with them…? Micky: I would say 75% of things we ended with were as we started, the rest really is down to Bobby, he’s such a gifted musician in all aspects… he just hears things that normal people don’t, and he has the ability to take that and make it sound great too. He is the best and it’s criminal that he’s not better received in his own right as a stand alone artist; I guess it’s the price he pays for being such a great guitarist. 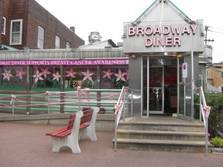 The album was recorded and produced in Red Bank, location of the Broadway Diner and the world’s best pancakes… what made you decide to go stateside to do the recording? Micky: The Broadway Diner… and Diana, the waitress there… I called her “Princess Diana”… she looked after me so well, I gained about two stones thanks to those pancakes!! No really, it was having Bobby and the guys there… also the rate of exchange makes things very economically viable to go there too. Did you get a chance to perform any of your songs while you were there? If so, where did you play? Micky: Yes, I played at a local Irish Bar near Rockland County with Joe D’Urso… we went to the open mic night and ended jamming with the local guys, it was great, we all got very drunk. Would you like to take me through each song on the CD and tell me the inspiration behind it beginning with the title track Blind Faith – I like this… reminds me a little of Badlands… guitar solo… Bobby? Micky: This was Bobby’s solo, amazing stuff and a real favourite of mine to play. Everything in the song is real. Micky: Another true story… she still has the red rose too! I had to write this song to save myself as I forgot Valentine’s Day… Joey Stann on sax and Southside Johnny on harmonica. Micky: My little girl has Asperger’s Syndrome… a type of autism. She is really lovely and happy, but it bothers some people… I had a van with a crack through the window, like my little girl it made no difference… but that crack really bothered some people. Southside again plays some wicked harp… he can really play that thing. Micky: A sad tale… sad sad sad… set to a Johnny Cash type backing, one of my all time heroes. Joey Bellia drums this really well… completely unusual for the Jukes this “country” feel… but like everything they do it sooo well. Micky: Yeah… another break up song… sitting round feeling sorry for myself… BUT AS NEXT TRACK SAYS……..
Something For The Pain – you teamed up with Joe D’Urso and Stone Caravan for this track and switched producer… is this maybe something you have been performing with Joe when you’ve been touring with him? Micky: No, we never done this before… it was an old song I had and I wanted some really heavy guitar-based rock track on the album… I thought it would be great for Greg Lykins, Joe D’Urso’s guitarist but he was ill so we brought in a friend of Jon Noll, the studio owner, Richard Lloyd, who played in the band Television, one of the founding fathers of new wave music which ultimately brought us punk and all the other side of my musical heritage… sort of full circle… Richard is an awesome guitarist. Daddy’s Penitentiary – I Fought The Law… is this one of your favourite songs or maybe it holds a special meaning for you? Micky: Just a good old trial and retribution song… I fought the law and the law won…why did he fight the law?? What did they win by?? This answers those questions. What Brought Me To This Town – I really like the arrangement on this track… did you have a particular town in mind when you wrote this? Micky: My friend’s niece had twins… very, very early and the doctors said they’d die… one lived, Sophie. On the day she had the babies it snowed, also very early… the eternal conflict in nature, life and death struggle. Sophie’s about 9 now, I haven’t ever met her. Of all the songs you have ever written which one is your absolute all-time favourite and why? Micky: They’re all different and the favourites change daily but if I had to choose one I’d say Falling Apart At The Seams or Blind Faith. What plans have you got to promote the album? Micky: Get out and play it to anyone who wants to listen… it’s so difficult to get radio play these days, and advertising is so prohibitively expensive it’s the only thing I can do. How can people buy a copy of the CD? Is there anything else you’d like to add about your experience of recording with Southside Johnny and the Asbury Jukes? Micky: It was a great experience seeing how the pros do it… and Southside was just this amazing mountain of knowledge and really cool. And Bobby was a joy to work with, just so talented and so very focused on what he does, he is a real inspiration. What’s the next thing on your to-do list? Micky: Next thing to do… just keep playing, hopefully getting better at it and try and keep the wheels turning. Blind Faith is Micky Kemp’s third CD release and contains 11 original tracks that span a range of tempos including straight-ahead rock, ballads and country rock. Yes, the backing band are fantastic and the production on the CD is outstanding but the thing I noticed most of all was the proverbial stamp that has “Micky Kemp – singer/songwriter” written all over it. Micky Kemp is very definitely a musician in his own right, with his own ideas and his own dreams and visions for the future. “Blind Faith” stands testament to that.